Netripples Pharmacy Drug Store includes, Managing Drug Database Drug Location, Managing Drugs expiry alerts, Managing Suppliers, Managing Purchases, Managing General Surgical and non Surgical Items, Managing Sales and Billings, Sub locations with over 100 Individual/Summary Reports You can have your Pharmacy Store Logo, Address and other header setup and utilities to add SMS and other Mobile access features. 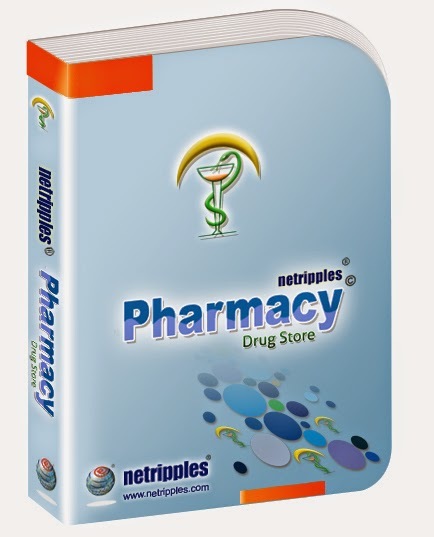 Netripples Pharmacy Drug Store is a comprehensive solution designed to automate the activities of the Pharmacy Drug Store which includes, Managing Drug Database Drug Location, Managing Drugs expiries, Managing Suppliers, Managing Purchases, Managing General Surgical and non Surgical Items, Managing Sales and Billings and many more. You will find over 100 Individual/Summary Reports which provides you day, week, monthly or any periodic reports anytime. It is designed with an easy-to-use user interface with Pharmacy Store Logo, Address and other header setup and utilities to add SMS and other Mobile access features. Manage Drugs : This screen helps to Manage Drugs. You can ADD, MODIFY a Drug with its Parameters like Drug type, Generic Name , Drug name, Drug Location, Strength, Reorder level, Manufacturer and Setup of customized PLU number or Bar Code. Drugs /Items Receipts : This screen helps in managing receiving of Drugs and Other Surgical and non Surgical /Medical Items from various suppliers including free quantities and also you can receive Drugs and Items with Purchase order without Purchase orders and also have options to receive with Bill or without Bill under delivery challans or Delivery Notes or Goods Receipt Notes or memos. You can setup Barcode and organize for stock in relevant locations identified. Vendor Payments : This screen helps in managing all Supplier Payments for all the Drugs, Surgical Items, Medical Items and other General Goods. You can make Part payments, full payments, review outstanding payments, find the total transaction payments, deduct Purchase returns and also do adjustments against the expired drugs returned to the Supplier or Vendor. The drugs received from a particular supplier. Sales / Raise Bill : This screen helps in generating receipts for customers for the purchased drugs, General and Medical Items. You can have option of Drug Manufacturing Date, Expiry Date, Batch number, Barcode , PLU number, Prescribed Doctor/ Medical officer Name, Hospital or RMP along with option to have the Patient Name and Patient Id for prescribed drugs and options to ad as relevant for non prescribed Drugs.